Situated atop the pristine white sandy shores of Clifton 4th beach, this sensational Bungalow is Located on the most glamorous stretch of Cape Town coastline 'Millionaire Row', pure North facing. 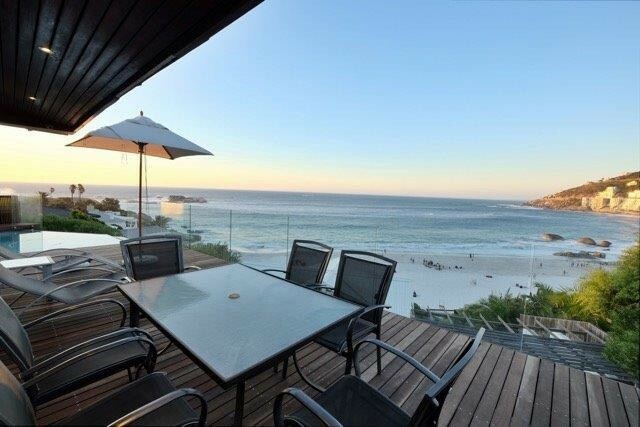 Overlooking all 4 famous Clifton Beaches, one has the incredible advantage of breathtaking views over the crystal blue waters of the Atlantic Ocean and the therapeutic sound of the waves, whilst sun tanning or bathing in your own heated swimming pool. The bungalow consists of 4 bedrooms (2 en-suite), (sleeps 8 people), 3 bathrooms in total, private garden with 10-seater table and 2 BBQs (wood & gas). The main bedroom is air-conditioned with Egyptian cotton linen on the king size bed, bedroom no 2 is also air-conditioned and has a fan, bedroom no 3 is also air-conditioned. Added features include a 55" TV, PVR/DSTV (2 separate channels), sound system, DVD and wireless internet. Additional features include a private garden, solar heated salt water pool and parking for 5 cars. Located a short 2 minute walk to the popular pub and restaurant (Ex - La Med) now called "The Bungalow" and a very short drive to trendy bars and restaurants in Camps Bay. There is a security guard outside the bungalow every evening (12 hours). The bungalow also has an alarm system backed up by ADT security.